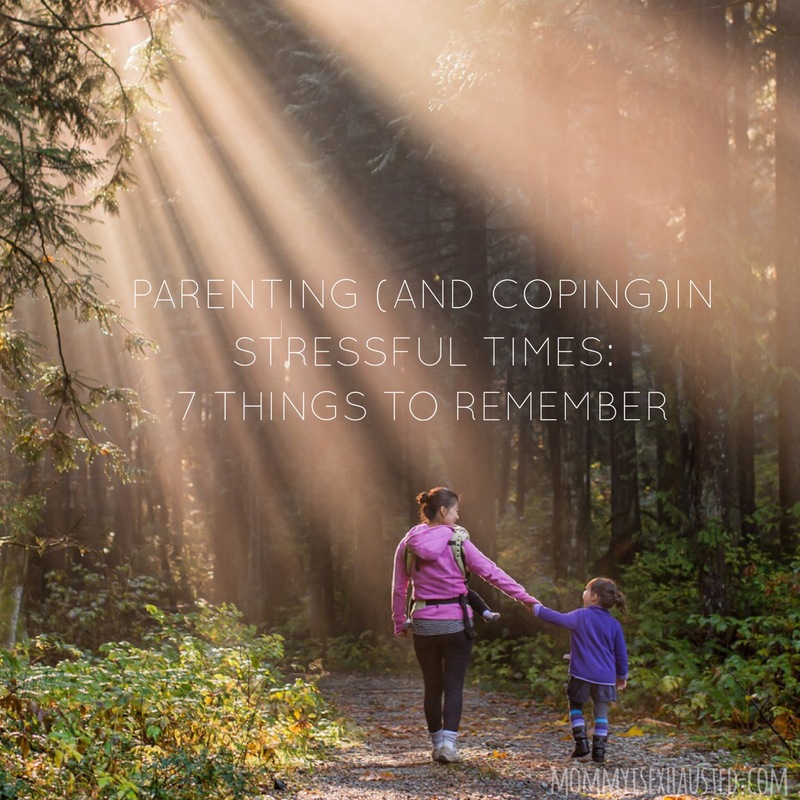 Parenting during stressful life events: 7 things to remember. This week has been a whirlwind. We planned out our dinners on Sunday, made it through school drop off on Monday and I even got a walk in at the lake with my friend Emily! It seemed that the week was starting off nicely (aside from an extremely hard drop off at school Monday morning– oh Mondays.) Then we got a text to come to the hospital an hour away to see a family member. The week has been an emotional rollercoaster. I’ve found it extremely hard to parent, get my work done, be there for my husband and also have my own worries and sadness on top of everything. Thankfully my mom helped us out and things seem to be on the upswing. Well, aside from the ton of work I need to get done that is not currently getting done because my hospital wifi won’t connect to my work desktop! ahhhhhh!! stress. I guess since I can’t do my actual work I will share a few thoughts I’ve had on making it through a stressful time. 1- Take it as it comes. There is no need for speculation in hard times, it is going to be how it is. Simply making it from one moment to the next is all that is expected of you. Going with the flow is kind of necessary. 2- Vent. I don’t know how many friends I’ve vented to this week. I just needed to tell someone how I felt. My fears, my sadness, being overwhelmed. I needed a listening ear, and thankfully, I’ve had quite a few. 3- Kids. I think it is easy to think in situations like this, ahhhh HOW am I going to possibly handle my children right now? There is so much expected. We have to travel and stay up late and not have real meals…but they need routines. It is especially hard to have a little one with food allergies (that means no pick up McDonalds) and another one with serious anxiety and OCD. BUT…this week I’ve not focused on these things. I’ve had help from my mom, offers to help from my friends, and family members that helped calm them and keep them entertained. Kids are go with the flow, especially when you take the time to appreciate them, comfort them and love them. Its great for them, and really great for you. Kids can always make you smile and always make you laugh. They are such blessings. 4- Keeping the kids entertained. If you have to take the kids to the hospital… it is important to pack an entertainment bag! My kids are 4 and 1. I packed blocks, books, kumon writing books, pencils, toy cars, the ipad, chargers (so necessary), snacks, a baby doll for my little girl, etc. For the most part, they stayed pretty entertained. Do not, I repeat, do not go to the hospital without these things haha. You think you’ll be there for an hour or two but you are there for 6. It happens. Be prepared. 5- Ask for help. If you need help with anything, ask. It takes a village and your village is there to help you when you need them. Whether it be with work (which I’ve definitely needed help with– and amazing coworkers have stepped up to help with that), childcare, or running errands. Sometimes you can’t do it all and you need that helping hand. Reach for it. 6- Prayer. Spending time to reflect on the events of the day and pray that all will be taken care of and trusting that, is essential. God has shown us miracles this week and we are so grateful. Prayer changes things, and us. 7- Sleep. Don’t be dumb and stay up late catching up on TV. (guilty.) Sleep really is essential. Sitting in waiting rooms isn’t physically exhausting, but stress is very mentally exhausting. Your body wants you to sleep… when you get the time, do it. Seriously… do it. Your body needs to relax and recharge. Through a very stressful week I’ve found peace in quiet moments, tickle fights with my kids, sweet embraces from my husband, and the love that is so present in serious times. Family is so very special. I am grateful for mine.